Today: Tara O'Brady has created a subtler take on pumpkin pie and livened it up with chai spice. I prefer a pumpkin pie that is subtle in its spice and sugar, with a creamy and tender filling, against a crust that has both flake and crunch. I’m lucky to have a friend in Nikole Herriott (of Herriott Grace), who likes that kind of pie as much as I do, so we paired her photographs with my recipe for one of our favorite versions. We used the pastry dough from my upcoming cookbook, and a filling inspired by the spices used in Indian spiced tea, masala chai. 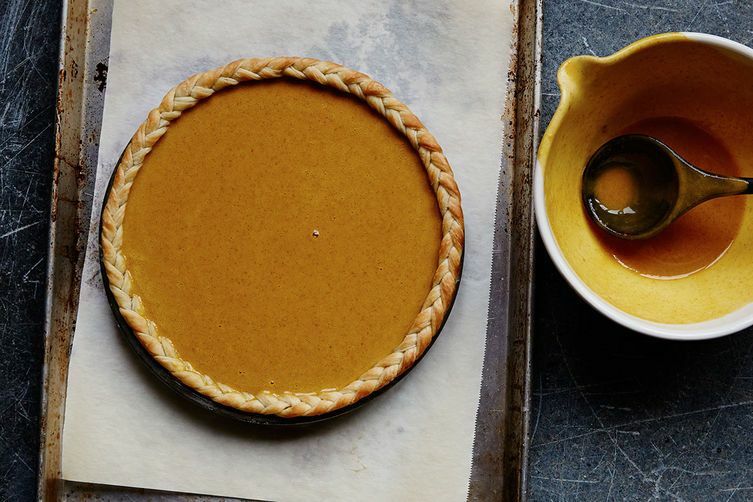 The combination is only a bit of a departure from traditional pumpkin pie, but enough of a change to count. Adding crème fraîche to the roasted pumpkin keeps things velvety, and straightens up the sweetness. I usually serve pumpkin pie with some whipped cream that's folded through with just enough maple syrup to take off its edge, but If in the mood for true gilding, I’ll serve it with a Black Tea Caramel -- heady with Darjeeling and cardamom, it completes the whole masala chai thing the pie has started. More: Learn the finer points of making your own squash purée. For the crust as shown you will need almost enough dough for a double-crusted pie for the bottom pastry and braid. Use a wash of an egg beaten with water to affix the decoration to the rim before blind baking. If there is any concern about the amount of filling -- if it’s creeping up to the point where it might overflow -- bake any extra in a buttered ramekin alongside the pie. As soon as it swells in the center, it’s done, and then there’s the bonus of a cook’s (or in this case, baker’s) treat. This article was brought to you by Squarespace! Use code FOOD52 to get 10% off, and share your favorite pies on Pinterest to win a yearlong subscription to Squarespace and a PieBox Gift Set! Food writer and creator of the site Seven Spoons. Author of the bestselling cookbook of the same name (Ten Speed Press and Appetite by Random House). Food columnist for The Globe and Mail. I would appreciate reading comments from people who nave actually tried the recipe. It, and all the others, read well; but how did the baking work out for you? Any glitches or surprises? Did anyone tinker with it? I made it- it was amazing. I'm going to try this, my mouth is already watering. Love that you feel that way! I do hope you give it a go. Lovely. How do you make the edge on your pie crust? Hello! There's instructions in the method for the pie — if you follow the recipe link at the bottom of the ingredient list — but, for the crust it's a simple braid, affixed with some egg wash. I hope that helps!